I think, from a brief scan of the various previous posts that you have a 1946 Burman CP 'box and a '58 engine so bear that in mind when you're looking for the clutch assembly. I have no experience of the compatibility between a '58 engine and '46 gearbox so can't give you any guidance on that score. Yes, as Dave said I'd fit a Monobloc rather than a Mikuni, or if you want to save a few a few quid, a Concentric, but the Monobloc would look more in keeping with the bike's age. Don't be tempted to buy second hand - folk rarely get rid of a good one. Thanks Spriddler, I am aware of the mis-match between chassis, engine and gearbox, we shall see how it goes when I try to mate everything together. Funnily enough my daughter asked me what I wanted for Christmas just after Daves last post so she has gone off to get me a copy of Bacons book. Whatever carb I go for will be brand new. I agree that most used items need more spending on them than the price of a new one. The carb will be an easy item to get so is further down my list of things to get. At the moment I am gathering the obvious items that I need (like the brake parts) to get the bike loosely put together. I have another bike to put back together first (the new pistons for which arrived yesterday) so that will get done before I can clear the bench for the G3 but it shouldn't take too long once I get clear of doing pre christmas chores for a higher authority. My first AMC bike in the mid 70's was a 350 with 500 top end. I bought it like that. I doubt that had been rebalanced and that was a good engine, it went well and I don't remember excessive vibes. If it was me I would go for the alternator engine, with ally chaincases, leave the 500 top and fit an AMC gearbox and clutch. Oh and a SR1 mag. Best combination, good 12v lights and easy starting. Dave, thanks very much for the recommendations. The bike is a bitsa so am not precious about keeping it standard so fits in with what you have reccomended. In fact after after building two basket cases of much rarer bikes to pretty much standard spec (in fact one was only half a basket case) I am very much looking forward to not being too bothered about "correct" but instead going for something that works well and is fun to ride. Thanks for the tip on the lever. I spent some time last night looking at every online image I could to see what the lever looked like and had noted the dog leg in it compared to others that are straight. I will watch that one and see if I can nab it. Over the last 9 months I've been rebuilding a G3/LS incomplete basket case. I've put it together using what bits I had to hand or could find easily. The frame, Burman gearbox and engine are all from the original '54 G3 and I've got a dating certificate to that effect. The engine, however, wasn't complete so it now has a cylinder head from a later machine that uses the shorter push rod tubes. I didn't have a magneto but I did have the bottom end of a '60 M18 500cc engine so I've used the cams and timing cover from that machine and the G3 will now be points and coil ignition. I've also used a later AMC gearbox as it was in much better condition than the Burman box. I've also used the AMC clutch. There are other 'mods' including the fitting of flashing indicators. The purists and rivet counters will hate it but I've put it together to ride, not be a sterile trailer queen. Pharisee, thanks for the insight into your project. I will read your blog with interest. 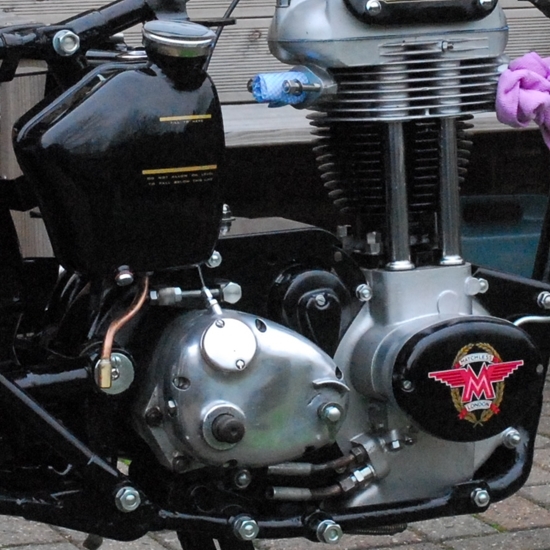 I did have a blog on another forum about a bike build that I did but it has been the victim of the photobucket change of terms. Wow Pharisee, I have just read your G3 blog. Very well documented and it looks like you are nearly there with it and it is good motivation for me to get mine moving forward. I also learned a few things about things such as the differences between Burman and AMC gearboxes. I think I need to read your other blogs now.